AMD has a message for anyone clinging to Windows 7: 'No Ryzen drivers for you!' The Sunnyvale chip designer was previously said to be working on chipset drivers for its upcoming socket AM4 platform for Windows 7, and it was, but has now decided to only support Windows 10. "To achieve the highest confidence in the performance of our AMD Ryzen desktop processors (formerly codenamed 'Summit Ridge'), AMD validated them across two different OS generations, Windows 7 and 10. However, only support and drivers for Windows 10 will be provided in AMD Ryzen desktop processor production parts," AMD told PCWorld. AMD's statement is confirmation of what Microsoft has been saying for some time now, that Intel's Kaby Lake processors and AMD's Ryzen desktop chips would only be supported in Windows 10. Microsoft's reasoning is that it makes more sense to align the design and shipment of hardware and software as close as possible to ensure that all of the features are supported. Since Windows 7 came out long before Kaby Lake and Ryzen, there was no way Microsoft could account for features that Intel and AMD would ultimately bake into its respective CPU lines. "As new silicon generations are introduced, they will require the latest Windows platform at that time for support," Microsoft said last August. "This enables us to focus on deep integration between Windows and the silicon, while maintaining maximum reliability and compatibility with previous generations of platform and silicon." Whether that's really the case is up for debate. 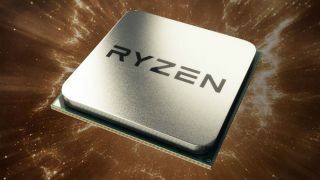 AMD did test Ryzen on Windows 7 where it presumably booted up just fine, but there might have been some features that didn't work as anticipated. This doesn't necessarily mean you can build a Windows 7 system around Ryzen. It should still boot and run, it just might not perform as well. There could also be bugs that cause wonky behavior, and if so, no patch will come from AMD. So, it's a roll of the dice. It also remains to be seen if AMD stands firm on only supporting Ryzen in Windows 10 across the board, or if eventual Ryzen-based APUs will prove an exception.